Coral Stitch is a knotted stitch, sometimes even called Coral Knot, and it's worked on a line. You can stitch the lines straight or curved, and because it has little knots along the line, it's a good way to add some texture to whatever you're stitching. As you stitch, you go through the fabric and knot the embroidery floss on the surface of the fabric. The stitch can be worked left to right as shown above, or in whatever direction feels most comfortable to you. My favorite way it to stitch vertically from bottom to top. To work the coral stitch, bring the needle up along the line. In a small, single stitch, go down through the fabric (point 1) and back up again (point 2). The needle should be perpendicular to the line you're working, with points 1 and 2 on each side of the line. With the needle still through the fabric, bring the working thread over the needle, then under the tip. Pull the needle through, and as you do, the knot will form. As you pull the thread, it helps to hold the working thread taut as long as possible. This keeps the stitch leading up to the knot tight. Repeat along the line, spacing the knots as close or as far apart as you wish. 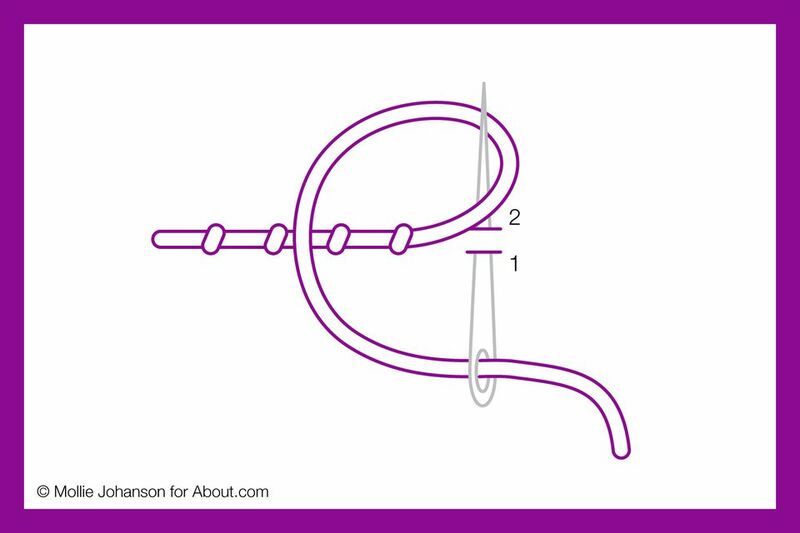 To end one length of thread, go down through the fabric immediately after a knot stitch, between points 1 and 2. Start a new thread coming up at the same point. What is described above is the sewing method for coral stitch, and in my opinion, it's the easier way. However, you can also use the stabbing method (bringing the needle all the way down and through the fabric and then back up again). For this method, take the needle down through the fabric at point 1, but don't pull the working thread through all the way. Lay the working thread along the line you are working, forming a loop leading to point 1. Bring the needle back up at point 2, going through the loop. Pull the thread to tighten the knot. Completed coral stitch will look like this. The example above was stitched with six strands of cotton embroidery floss, but you can use any embroidery thread. On the left side the stitches are a little less than 1/4" apart, and at the right side of the line, they are closer together. Adjusting the spacing is a great way to alter the look of this stitch. Use this stitch for making borders or lines, or for stitching curly hair or fur. It would even make fun lettering. Of course, you can also use it for embroidering its namesake coral in underwater scenes! Coral stitch can also be stitched in close rows as a fill stitch, similar to as you would with chain stitch. Space the placement of the knots so the rows nest together. Give this stitch a try and then try it again and again!